Old things! In today’s post, with a tour announcement at the end! So… Our Lady of the Pentacle announced that an inspection of a storage room we maintain would be enacted one rainy and quite recent Saturday. We entered the warehouse facility where our storage room is, which is a void mainly filled with the remnants of my career as a comic artist, and rummaged about. She was after a few garments of a certain vintage which were kept therein, and while she was searching for the items, I poked around in a cardboard box full of my Dad’s “things” which I kept after he passed on. I brought home some of his vintage camera gear, which was fairly well preserved and which I thought some of you Lords and Ladies of the Pentacle might enjoy checking out for their retro design goodness. There’s a fellow named M. Butkus over in New Jersey who has actually made the original instruction manual for the Sekonic available as a PDF, click here for the link. According to the various sources I checked, this little gizmo dates back to about 1954. Amazingly, the thing still works. 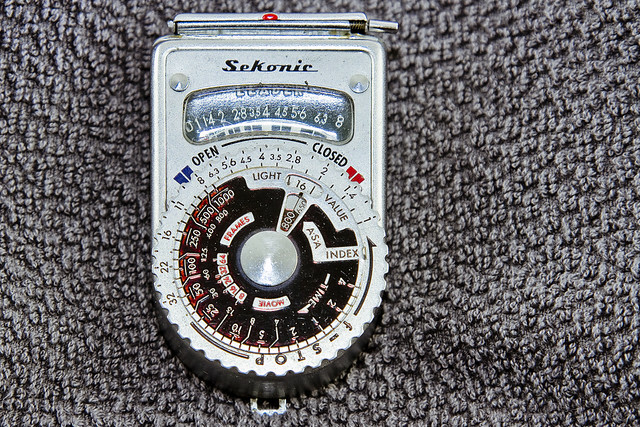 Sekonic is a Japanese company, one which is still around today, and they’re still making light meters. Before you ask – I checked and the thing would be worth eight bucks on eBay, were it still housed in its original packaging and in pristine condition. 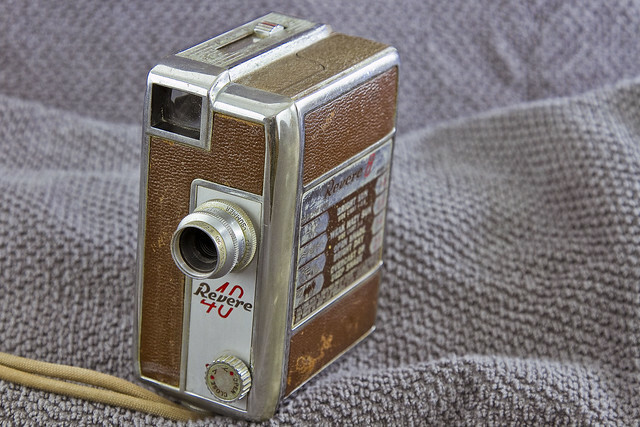 The old man always inferred that his “Revere 8 Model 40” 8mm movie camera was purchased at the same time as the Sekonic light meter, both transactions having occurred when he was “in da soyviss” during the late 1950’s. Given the proclivity towards games of chance that Dad and his Brothers all displayed well into the 1980’s, I always presumed he rooked somebody in a card game and received the movie kit in lieu of cash. This unit would have cost about a hundred smackers when it first went on sale in 1955. My Dad would have become physically ill if you asked him to spend $100 on a camera in 1985, let alone 1955. Take note of the fact that this camera was spring wound! You’d twist that big key at the bottom of the thing and then it makes a “whirrrrr” sound as the spring returns the mechanical energy to its internal mechanisms, driving both film path and shutter. The thing still works, incidentally. Revere was a Chicago based auto outfit formed in 1920 that originally manufactured radiators for cars. 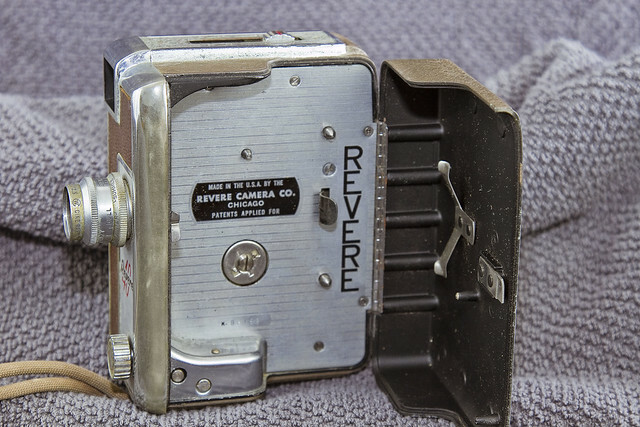 In 1939 Revere started making 8mm cameras, and then 8mm cameras and lenses in the 1950’s. 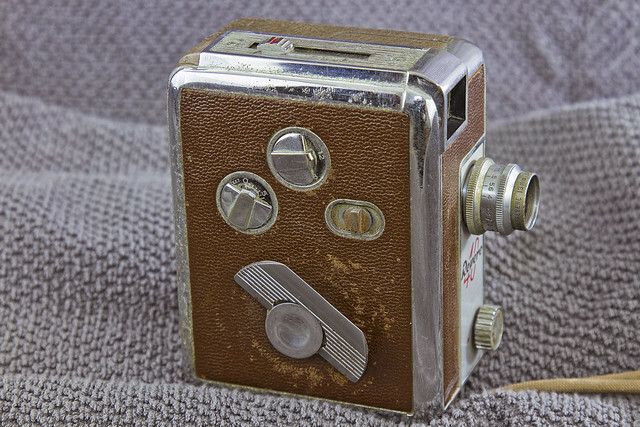 By the middle 50’s, they were the second largest manufacturer of consumer movie cameras in the country. They also manufactured projectors, tape recorders, and a very popular rotary shop tool. Revere was acquired by 3M in 1960 after the company’s founder grew ill. The interesting thing about the Revere 8 Model 40 is that it takes cartridge film. Kodak used to manufacture this sort of thing and kept the prices low enough on the film for the developing to be kind of expensive. 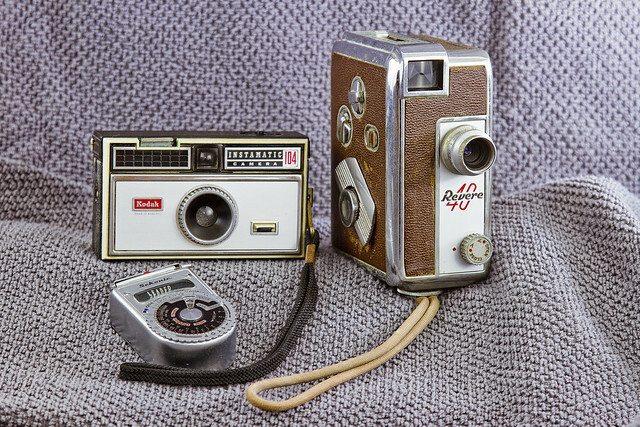 Kodak made its money on the developing, don’t forget, and they had a Standard Oil type of monopoly on the photography business before digital cameras and environmental laws annihilated their business model. One of my cousins digitized the old family 8mm home movies a few years ago, most of which were shot with this camera, which Dad would lend out occasionally. My Uncle Irving took his side of the family to the World’s Fair in 1964, and I uploaded what he shot to my flickr account – click here for a brief and somewhat blurry glimpse into the past, as captured by the Revere 8 Model 40. On the subject of my “depression era kid” Dad not wasting his money, one of the items present in his “box of things” was a sample of the aforementioned cartridge film. 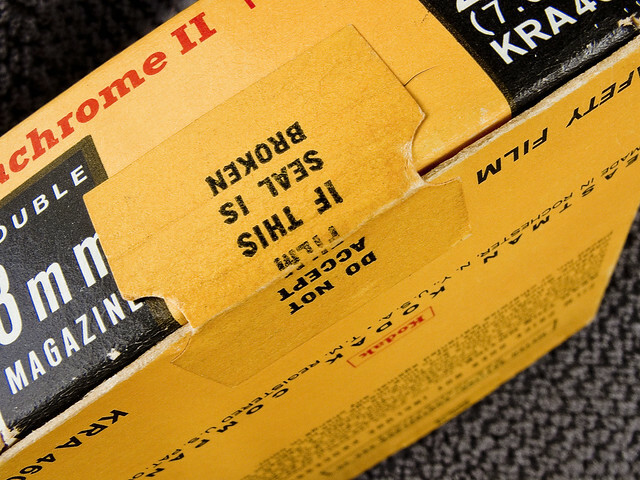 What cartridge means – for you youngins – is that the film was entirely contained in a plastic shell that had mechanical plug in spots which allowed the camera mechanism to smoothly drive the film past the shutter. 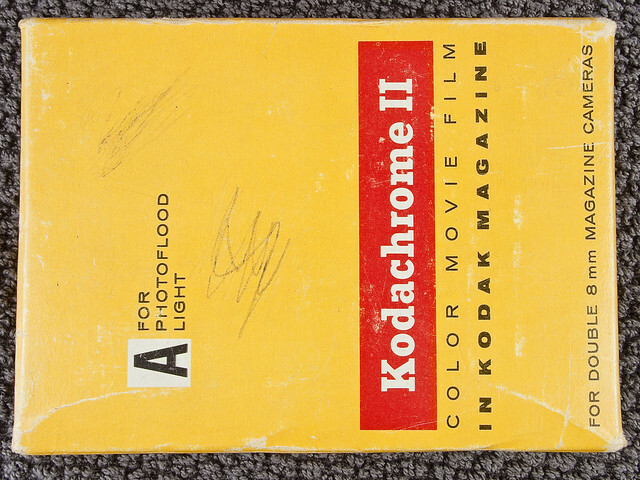 The film was entirely contained within this plastic shell, which allowed one to safely load or unload the device sans dark room or light fast bag. 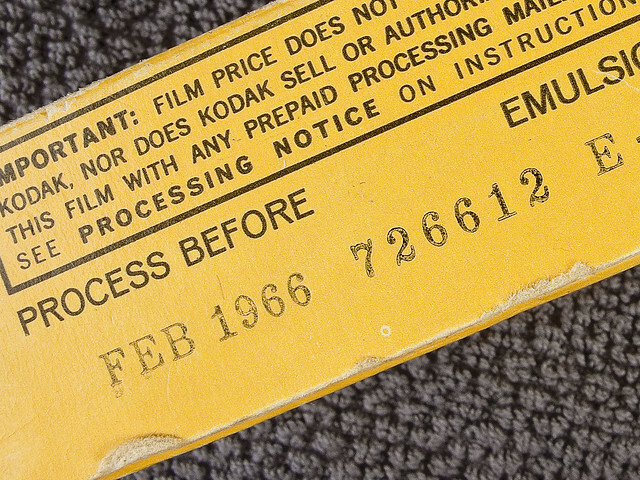 The amazing thing – well there’s two amazing things – one is that this box of film was meant to processed by February of 1966, which actually makes it older than me. The other is that it’s still unopened and factory sealed. 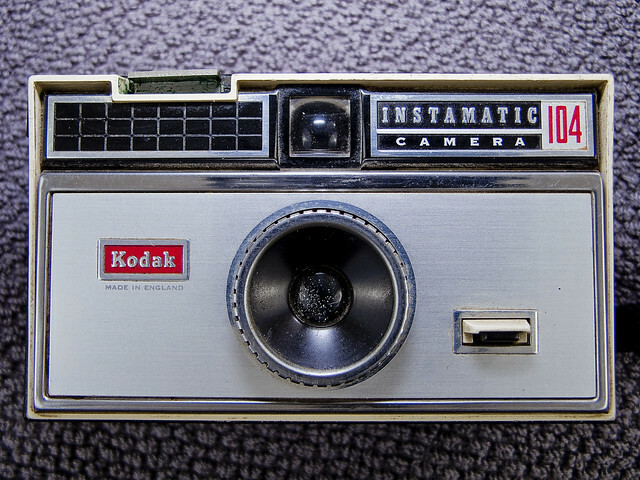 Less remarkable, but still old timey cool, is the Waxman family Kodak Instamatic 104 camera. A still camera, the Instamatic also used cartridge film. Manufactured in England, of all places, the Instamatic is likely one of the most popular cameras ever produced and something like fifty million of them were shipped out to customers. The Instamatic 104 hasn’t held up that well over the years – its shutter no longer pops, and there’s a lot of corrosion on the coatings of its plastic surfaces. 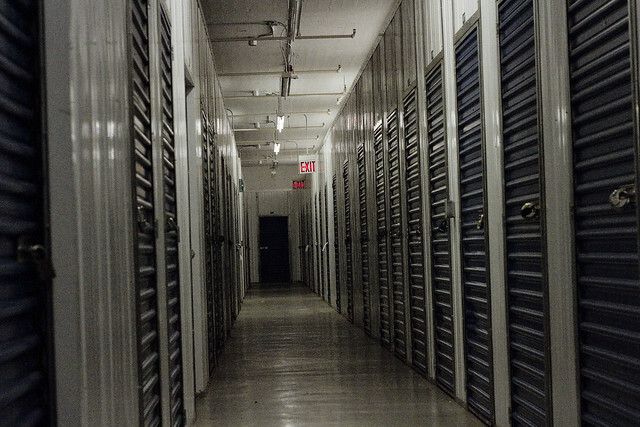 The scrolls of Eibon, the Dread Necronomicon, the lost ark of the Hebrews – all must be waiting for some unlucky or intrepid soul to find them within the hundreds of thousands of cubic acres utilized as the anonymous storage rooms which are spread about in New York City. Who can guess, all there is, that might be locked up in there?